Benches: The Most Versatile Furniture? You may think of a bench as merely a seating area, but it can be so much more than that. Imagine a functional, sometimes upholstered seat that not only heightens the aesthetics of any room but also doubles as storage space. Add decorative pillows to give it a cozier feeling. You won't want to leave your new furniture addition. Here are some ideas on how you can incorporate multifunctional benches into your home. Store Important Documents: Let's face it, filing cabinets aren't exactly the most aesthetically appealing pieces of furniture in a home. Although they work well in an office setting, the industrial, steel (or metal) look doesn't make one feel warm and cozy. If you want a more attractive and inviting storage space, why not make a storage bench specifically designed to hold files? Personalize it with a cushion on top in any pattern of your choice. Put Toys Away: If you look close enough, a bookcase can also become a versatile bench-and-bin combination. A bookcase's large openings can make excellent cubbyholes to fit toy-filled bins. Choose from canvas bins, plastic bins, or even woven baskets-- anything to match your playroom decor. Once your children outgrow their playroom bins, recycle and use them for storage in the garage, laundry room, or bedroom. Stash Serving Trays: For those who love to entertain and throw fancy dinner parties, storage can quickly become a problem. Where to put all the serving trays, plates, placemats, and tablecloths, when the guests have left? A banquette bench with drawers underneath can be the perfect solution to your storage issues. Not only do banquette benches act as comfortable nooks on which to perch while you eat, but they also function as a secret repository for your dinner party supplies. Enhance Your Mudroom: Mudrooms are a gateway from the outside world into your warm and comfortable home.Improving your mudroom can start with a versatile DIY shoe bench addition. Build a shoe bench with larger compartments for boots and smaller ones for more compact footwear. 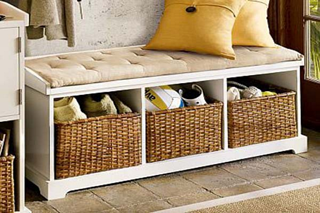 Now, the next time you walk through the door, you can leisurely sit down and stash your shoes. Stash Bedroom Knick-Knacks: There's nothing better than coming home after a long day at the office and relaxing on a sturdy and comfy reading bench. It is a dedicated relaxing space, whether you use it as a reading nook or a window seat. What would make it better? Add cubbyholes underneath to store your books, shoes, clothes, or anything you don't need readily available. These practical furniture additions just go to show how a bench can transform into just about anything you want. Whether you want it for storage, relaxation, or aesthetics, the bench has it all. Now all you have to do is decide how many you want in your home.